Paws 4 Thought Pet Tags specialises in offering sturdy pet ID tags for cats, dogs and all of your other furry friends. We carry a broad selection of customisable solid brass pet tags at cost-effective rates. The Police Force, the Army and Mountain Rescue make use of such tags to easily identify their dogs. 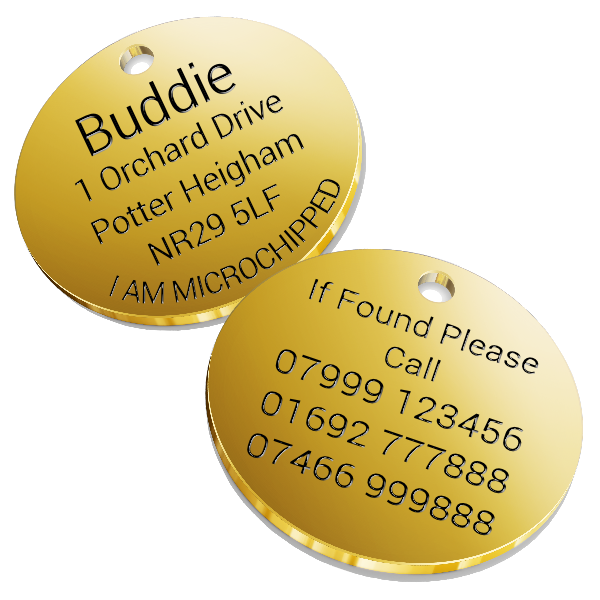 Our brass pet ID tags are made from 1.5mm thick and 30mm diameter polished brass and they are embedded with black infill for easily legible lettering. Each of the tags is inscribed using the latest technology and tools and is resistant to water. The wording on the tags will not fade away easily. At Paws 4 Thought Pet Tags, you will find solid brass pet tags that are engraved on both sides using a diamond-tipped precision tool. We can carve information up to 5 lines on each side. The tags will be embedded with the wording of your choice. It is recommended that you provide important information, such as the name of your pet, address and other such crucial details. By getting a personalised solid brass pet tag from Paws 4 Thought Pet Tags, you will become a responsible pet owner. It will also make your cat, dog or rabbit feel special and a part of the family. Also, it will rid you of having to constantly worry about the whereabouts of your beloved pet. What are you still waiting for? Browse through our extensive collection of solid brass pet tags to place your order. Sit back and experience our lightning-fast delivery service.